ROSELAND, N.J., Sept. 26, 2018 /PRNewswire/ -- According to findings from the Rethinking Gender Pay Inequity in a More Transparent World study released by the ADP Research Institute® today, a larger proportion of women begin their career at a lower wage compared to men. By following the career paths of male and female exempt new hires who stayed with the same company from the third quarter of 2010 until the end of 2016, the ADP Research Institute found that women, on average, are paid 17 percent ($15,000) less in base salary than men. However, when factoring in the gender pay gap for incentive pay (69 percent), the total earnings pay gap widens to 19 percent ($18,500). "We're looking at pay equity in a very unique manner," said Ahu Yildirmaz, co-head of the ADP Research Institute. "By studying both salary and bonus pay between genders at the time of hire and after six years of tenure within the same firms, we found that the overall pay gap between men and women worsens due to disparity in bonuses. Additionally, while it has been believed part of the wage disparity is due to women assuming the role of family caregiver and therefore prompted to leave the workforce, the findings show there is minimal evidence women are more likely to quit their job compared to men." When categorizing new hires by age and income, women ages 20 to 30 with a low starting salary had near-equal base pay of men; however, the base salary gap worsened for females after six years. Additionally, when bonus is factored in, young women fared the worst with a 21 percent less bonus-to-base ratio compared to their male counterparts. However, for the 40-50 age group, men and women started their careers with almost no base salary gap for all income groups, and women did well keeping up with men in base salary growth for the next six years. In fact, in most groups, they closed the base salary gap. The disparity here is with incentive pay, especially with the lower income group. In the $40,000 to $60,000 income range, female workers received an average bonus of 8.5 percent, whereas men received 11.4 percent—a gap of 74 percent. When looking across industries, incentive pay made some very distinct impacts. Women working in the Information sector make 7 percent more in bonus to base ratio than men, which lessened their overall gap in total earnings. In contrast, women in the Finance and Real Estate industry are earning 21 percent less in their bonus to base ratio compared to men. 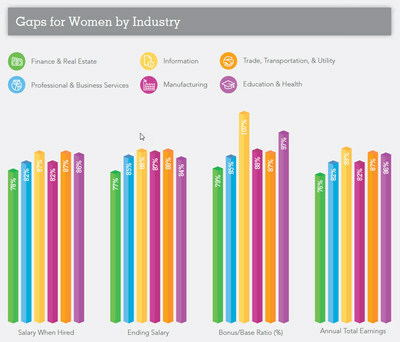 The industry has the largest pay gap for women with and without incentive pay. The average bonus amount for women was less than two-thirds of the amount paid to men who had equivalent base pay, age, and tenure. This incentive pay disparity was observed across all age, salary, and industry groups from moment of hire and persisted throughout the six-year study window. The Rethinking Gender Pay Inequity in a More Transparent World study gives an unprecedented look at gender pay inequity to determine the relative contributions of recruiting, base pay, and incentive pay to an overall gender pay disparity across the U.S. workforce. The study took an anonymous sample of men and women—newly hired into exempt salaried positions, in the third quarter of 2010—and tracked their base pay, incentive pay, and average total income through December 2016. The study examined disparities in base pay and incentive pay between genders both at time of hire and after six years of tenure within the same organization. For more information about the report, please visit https://www.adp.com/tools-and-resources/adp-research-institute/insights/insight-item-detail.aspx?id=980AB372-B3B7-4AB4-A054-D0CED95059B0. ADP, the ADP logo, ADP A more human resource and ADP Research Institute are registered trademarks of ADP, LLC. All other marks are the property of their respective owners. Copyright © 2018 ADP, LLC.